Brushed finished stainless steel case & bracelet with polished beveled corners. Stainless steel octagon design bezel secured by 8 polished white gold screws. Brushed finished with polished beveled corners. 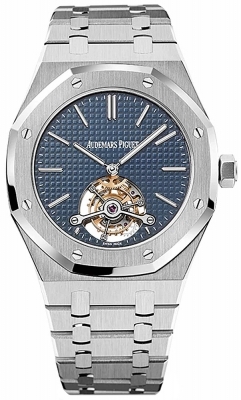 Blue dial with "Petite Tapisserie" design pattern. Applied white gold index hour markers with luminescent fill. Polished baton shaped white gold hands with luminescent fill.